A common sight in autumn, bright orange pumpkins bring color to the season. They are the fruit of the pumpkin plant and, aside from being carved into jack-o'-lanterns, can be used in making pies, puddings, breads, cookies and soups. Pumpkins are an annual plant and grow to maturity in a single growing season. This process begins with a seed planted in the spring. The seed of the pumpkin plant is approximately ½ to ¾ of an inch in length and about 1/4 inch in width. It is flat and oval in shape with a pointed tip. Inside is an embryo from which the plant will grow and stored starches that act as food in a portion of the seed called the endosperm. A hard outer coat protects the seed. Because pumpkin is a warm season vegetable, it requires warm soils to germinate properly. Once the seed is planted, moisture will enter through the seed coat and into the seed, triggering germination. The embryo will begin to grow, eventually splitting open the seed coat. It will first produce a root that will grow downward into the soil. The root will form tiny hairs that will absorb nutrients and water from the soil to nourish the plant. A small stem will form with two leaves, called cotyledons, from the endosperm. These leaves continue to nourish the plant with stored starches and also begin the process of photosynthesis. Over the growing season, the pumpkin plant will continue to grow. Roots will spread throughout the soil. The plant will take the form of a long vine that will trail along the ground. As it grows, it will continue to produce large leaves along its stem. The plant will also produce tendrils that will reach out and grab onto objects to stabilize the plant. 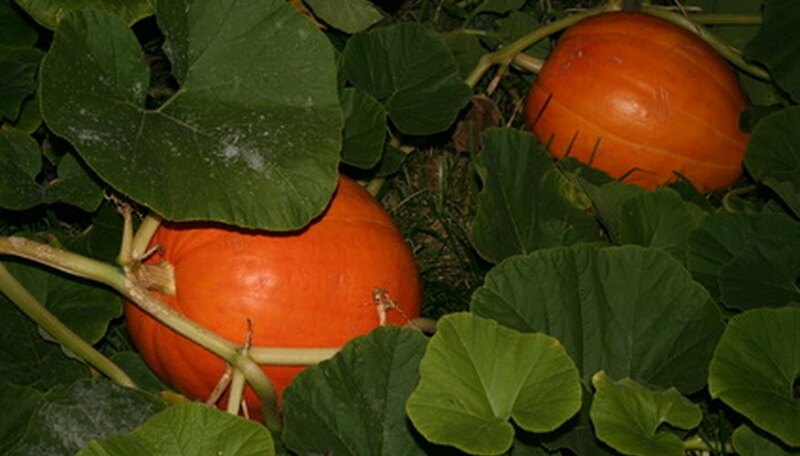 Pumpkin plants can reach 30 feet in length when fully mature. As the plant grows, it will produce flowers along its stem. Each flower holds both the male and female parts of the plant. The anther, the male part of the flower, produces pollen. When an insect, such as a bee, visits the flower to retrieve nectar, it inadvertently brushes against the anther and picks up some of the pollen grains on its body. The bee may then brush against the stigma, the female portion of the flower. The pollen will adhere to the stigma. It will then release sperm which will travel down through the stigma into the ovary of the flower. This will fertilize the plant and begin the production of new seeds. The base of the flower will start to grow and it will eventually drop its petals. As it matures, seeds develop within the fruit. The fruit itself can grow to a very large size, encasing the seeds within it. The pumpkin fruit will be green at first and will change to bright orange as it reaches maturity. If left unharvested, the fruit may rot and disburse its seeds. The pumpkin may also be eaten by animals which may help to disburse the seeds to an even greater distance from the parent plant. If harvested, the seeds are often recovered, dried and then used as food for humans and a seed source for future cultivation, thereby starting the life cycle over again. How Does a Pumpkin Reproduce?